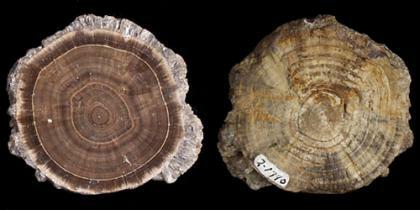 This piece of ancient wood has undergone the fossilization process called permineralization. When the wood was still living, it's tissues were full of pores and canals. After the soft, cellular parts of the wood decayed away, the harder parts of the branch that remained were buried and penetrated as groundwater flowed through the surrounding sediment. Dissolved silica in the groundwater precipitated in the pore spaces, completely cementing the piece of wood into a solid rock, while leaving the cellular structure intact. Most "petrified wood" is actually permineralized with silica.